As an iconic Parisian monument, the Louvre has been enthroned in the centre of Paris for more than 200 years, and is today the largest art and antiquities museum in the world. It has a long history of artistic and historical conservation, from the Ancien Régime to the present day. But what about this amazing glass Pyramid, which stands in front of the museum ? Designed by the renowned Sino-American architect, Ieoh Ming Pei, author of one of the wings of the National Gallery of Art in Washington, the project was to build a new large entrance to the Louvre, in order to accommodate the growing number of visitors and at the same time to redesign the museum’s interior. 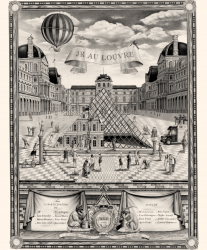 Announced in September 1981 by the President of the Republic, François Mitterrand, this project, which takes the name “Grand Louvre”, aims to restore the entire Palais du Louvre to the museum, since the Richelieu wing was once occupied by the offices of the Ministry of Finance. 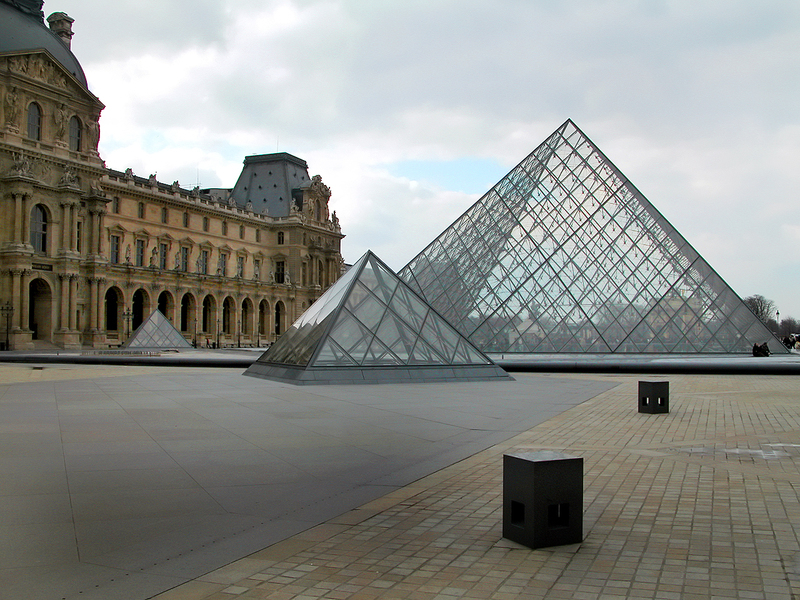 In 1983, Ieoh Ming Pei was appointed by the President to develop this major project, which would revolutionize the image of the Louvre Museum by giving it a whole new dimension, both nationally and internationally. More than an architectural project, the Pyramid has proved to be a real challenge. Its glass construction represents a technological prodigy; a crazy challenge for its author… This one takes up the exact proportions of the famous Pyramid of Cheops, a choice of figure that reminds us of the Obélisque already present not far from the museum, Place de la Concorde, but also the fabulous collection of Egyptian antiquities that makes the Louvre so rich. 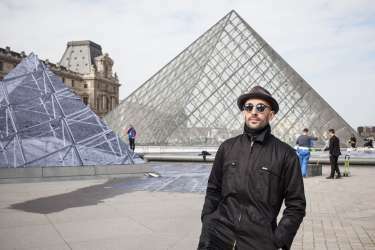 However, the architect is demanding and ambitious, he wants his Pyramid to be so transparent that it allows the Louvre stone to be seen as if nothing was in front of him. However, seeking perfect transparency proved to be a difficult challenge for engineers, who finally gave birth to a range of special glass for construction, which will be called the “Diamond” range. 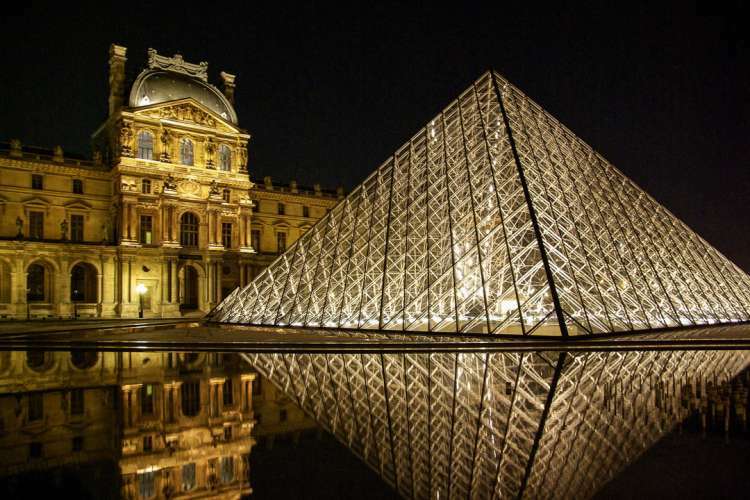 In fact, with its 673 glass plates, the Pyramid of the Louvre shines like a gigantic diamond, which brings a magnificent light to the site and allows the museum to enjoy it. For its 35.42 metres wide and 21.34 metres high, the Pyramid consists of 95 tonnes of steel and 105 tonnes of aluminium that support all glass tiles. Very feared by Parisians at the time, the Pyramid of the Louvre became perfectly integrated into the Palais and has today become the symbol of the museum and an essential part of Parisian heritage. It has recently become the playground of the famous street-artist JR, who by a gigantic collage had achieved a masterstroke in 2016, making the Pyramid disappear completely from the eyes of visitors. This year, on the occasion of the 30th anniversary of the Pyramid, he returns with a project of the same scale, since this time the objective is to create an optical illusion around the Pyramid to make it “come out of the ground” and “reveal the secret of its foundation” through an immense collage on the ground. In addition to this extraordinary artistic creation, the Louvre is planning some thirty events until February 2010 to celebrate the glass monument. All you have to do is come and admire this iconic Pyramid and take the opportunity to visit the famous Louvre Museum accompanied by an art history enthusiast… Do not hesitate any longer and visit the offer page, or contact us to live a unique experience in the heart of Parisian culture.